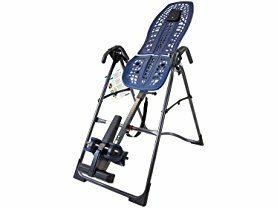 Today only this Teeter InvertAlign 900 Inversion Table is only $194.99 (Reg. $459.00)! The InvertAlign9 is the newest addition to Teeter's Fit Flex series. The Fit Flex bed comfortably flexes with the user with added features to help you achieve maximum benefits. Ideal for back pain sufferers, the EZ-Reach Ankle System with extended handle reduces bending when securing the ankle supports.